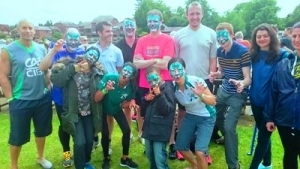 Green Tigers RoarThe Credit Agricole CIB’s London Dragon Boat Racing team, the ‘Green Tigers’, braved the choppy river Thames in June to raise funds for our charity. This is the third year the UK team have picked up the baton from their Hong Kong colleagues to compete at the Marlow Dragon Boat Festival. Thank you so much – we love the picture!